St. Mary’s 24th edition of Girls for the Cure raises more than $75,000 to benefit Community Cancer Care! 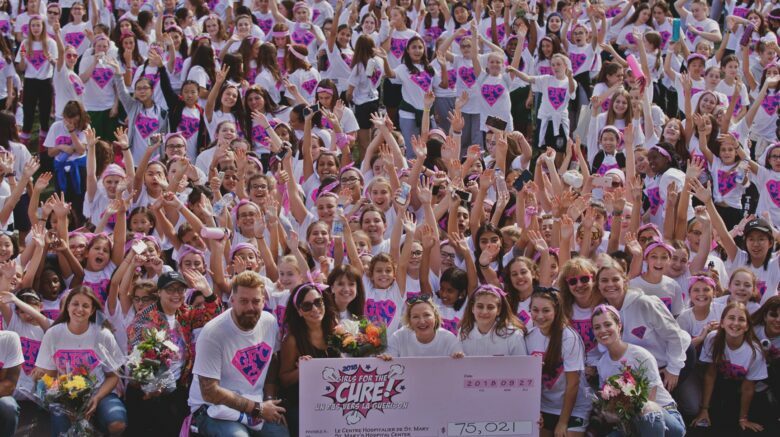 September 27th, 2018 – In picture-perfect weather, more than 1,000 girls from Montreal’s independent schools joined together in a massive show of support to raise awareness and funds for women-related cancers. Students from Lower Canada College, Miss Edgar’s and Miss Cramps, Sacred Heart School of Montreal, The Study and Trafalgar School for Girls collected donations for weeks from family and friends to make the 5km+ march from their various school campuses up to Molson Percival Stadium. In a true show of celebration, the girls took the final steps of their journey across a bright pink carpet leading into Molson Stadium, and channeled their energy and strength into an enormous, collective embrace of the health and wellness of women in our community. Heartfelt thanks to Virgin Radio morning show personalities Natasha Gargiulo and Lee Haberkorn who acted as emcees, DJ and dancers from Total Events & Entertainment who kept the energy pumping, and CTV’s Christine Long who broadcast live over the noon hour news. The girls heard a heartfelt testimonial speech by 23-year-old breast cancer survivor Lindsey Finklestein and Fitness Guru and Victoria Park Co-Owner Drea Wheeler who “rocked” the crowd while imparting a message for healthy living. Sara Diamond, Montreal Canadiens Anthem singer, shared her outstanding voice with a rendering of Sarah McLachlan’s “I Will Remember You” which stilled the crowd into a moment of silence to remember those we have lost and those that are fighting to win. Students took to the stage to perform their own student written cheer which was met with loud applause! Video compilations of years passed with special messages were shown on the giant screen in the touching hour that left a lasting impression for all. St. Mary’s Hospital Foundation President and CEO, Cynda Heward, called the Foundation staff to the stage as the students presented a giant cheque revealing this year’s results at an incredible $75,021! Since 1995, Girls for the Cure has raised over $3 million for the Community Cancer Care Centre at St. Mary’s Hospital Center. Congratulations to all the students for their incredible passion and enthusiasm which keeps Girls for the Cure marching year after year…see you for our 25th edition in 2019! …and congratulations to Trafalgar’s Emily H. who is the winner of our Girls for the Cure & Ardene Foundation Instagram contest!